Although Fort Campbell is located in Kentucky, Clarksville, Tennessee, is home to many military who work there. MilitaryByOwner has numerous listings in the area for both rent and sale, but these MilitaryByOwner Ft. Campbell homes for sale are all five years old or less. If your family prefers the predictability and low maintenance a younger home can offer, read over these four home descriptions; one just might be the perfect fit. Leave the older homes to folks who have time, money, and energy to spare! This castle-esque home only seems historic because of the turret style details. 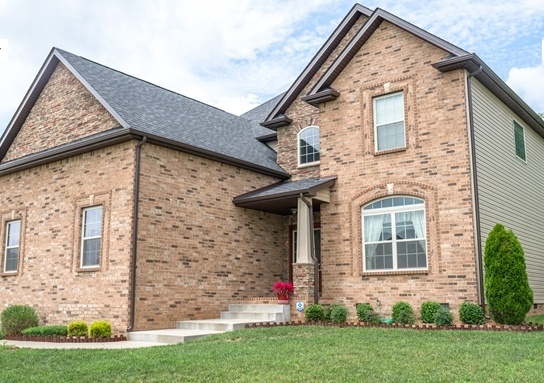 The curb appeal doesn’t end there, because the warm brick and arched garage door are features that make this house extra special. The spectacular glass plated front door alone is worth the trip to view the home. Inside, the upgrades continue. The vaulted ceilings in the foyer welcome friends and family to the open and airy living spaces with a stone fireplace holding center stage. The photo shoot worthy kitchen boasts dark cabinets with high-end backsplash and granite work to match. Seating around the bar is a welcomed addition in the kitchen. The master bedroom and bath are a getaway for its next owners. A sitting area, trey ceiling, double vanity, and jetted tub are ready for a spa weekend at home. The remaining three bedrooms are on the second floor, as is a bonus room. The house is completed by the addition of multiple outdoor living spaces. A covered deck, a pergola covered patio, and a fire pit to enjoy the seasons are right out the back door. 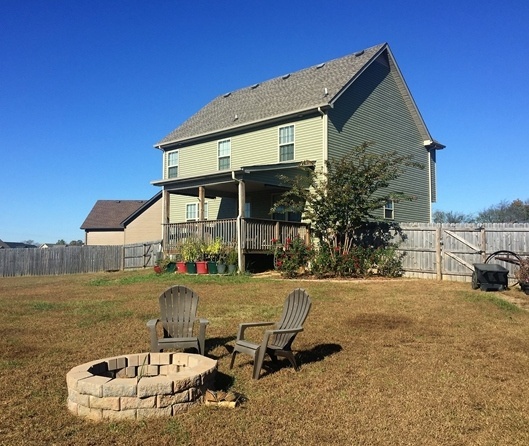 Situated on nearly 1.5 acres, this house on Spike Court is ready for outdoor entertaining. A pretty covered deck overlooks the fenced property, rose garden, and festive fire pit area. What awaits inside are some of the owner upgrades that any new buyer would be glad to have: custom wood-grain blinds, granite counter tops, and a nearly silent stainless steel Kitchen Aid dishwasher. The dark cabinets coordinate with the appliances and versatile gray paint in the kitchen. There is hardwood throughout the first floor, and an eye-catching stone gas fireplace to admire. Upstairs, all three bedrooms are together--an ideal layout for families with kids. An interesting offer comes with the sale of this house. Owners have the first the opportunity to purchase extra acreage located at 555 Tracy Lane, making this an even better deal at the current owner’s asking price. 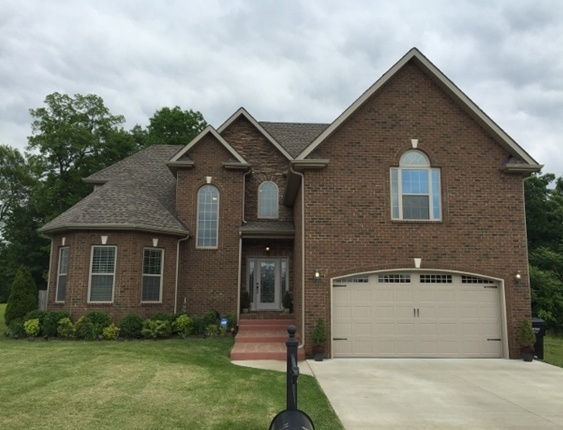 If a quick and no hassle commute is on top of the list for your home buying near Fort Campbell, look no further. Located between exits 1 and 4 from 1-24, this home has a perfect location in Fox Crossing for easy access. The location isn’t the only desirable feature of this home, however. Light-filled open concept living awaits new homeowners on the first floor. On the second, there are two bedrooms, a master suite with garden tub, and a convenient laundry. Downstairs, the granite and stainless steel filled kitchen is topped off with custom cabinets and a high end tiled backsplash. Doors in the dining area lead directly to the backyard, which is enclosed with a privacy fence. But don’t worry, neighbors won't be a problem because no one lives on the backside of the house. Storage is always requested by home shoppers, and this house delivers. It has additional space available in the floored attic and in the two car attached garage. Newer houses have more modern upgrades, and this home doesn’t disappoint. A wide open concept is an outstanding feature, complete with a balcony overlooking the foyer and living spaces. The vantage from above provides an excellent view of the quality of the gorgeous hand-scraped wood floors and gas fireplace. The deep colored cabinetry and granite in the kitchen offer a beautiful contrast to the light and neutral paint color throughout the house. From the kitchen, a French door leads to a fully shaded and well-maintained deck and a spacious backyard. Not to worry, your king-sized bed will fit perfectly in the abundant master bedroom. The master bath also supplies the must-have double vanities and jetted tub, as well as a tiled shower. Because the house has more than 3,000 square feet, there are two more bedrooms and a full bathroom upstairs. This is in addition to the extraordinary bonus room over the garage, which is the perfect set up for a guest suite. Finally, a two car garage provides plenty of space for storage and the opportunity for any hobbyist to have an area to call their own. 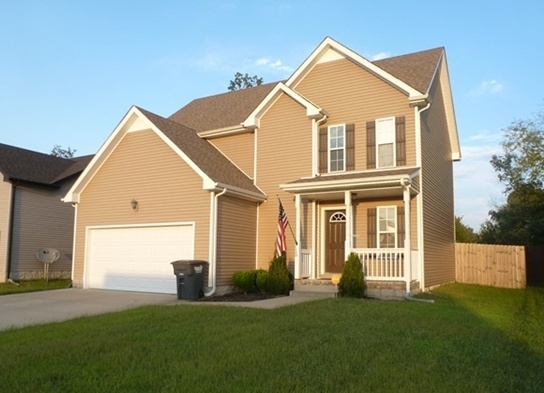 **Note: while these homes are no longer for sale, MilitaryByOwner’s inventory for Fort Campbell has dozens of homes for sale or for rent to browse through.